Study: Child Laborers In Bangladesh Are Working 64 Hours A Week : Goats and Soda A new report from the Overseas Development Institute finds that impoverished children are working long hours in violation of the country's labor laws. In Bangladesh, a new report finds, impoverished children are working long hours in violation of that country's labor laws. Children under the age of 14 who've given up school for jobs are toiling an average 64 hours a week, according to a British think tank. Researchers from the London-based Overseas Development Institute surveyed nearly 3,000 households in the slums of Dhaka. They found children as young as 6 employed full-time and others working up to 100 to 110 hours a week. On average the working children earned less than $2 a day. 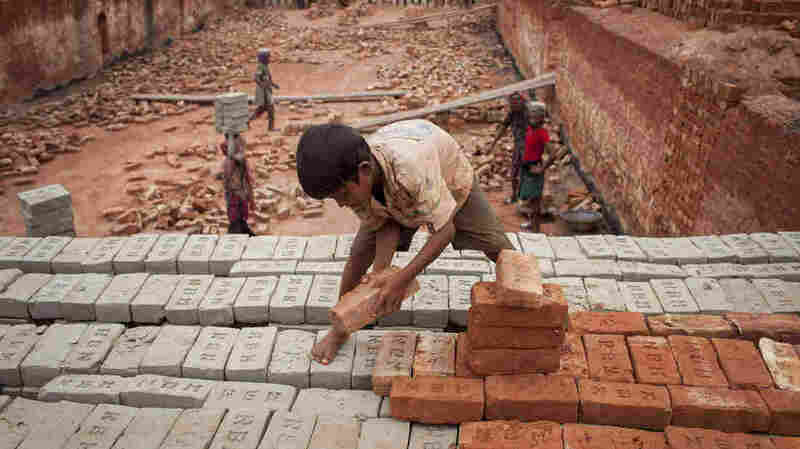 "The prevalence of child labor in Bangladesh is worrisome," says Maria Quattri, a research fellow at the Overseas Development Institute and one of the authors of the study. Quattri says the majority of girls who are employed are toiling in the garment industry. Boys' jobs are more varied. Some work as day laborers on construction sites or making bricks. Others sell products on the street or work in shops. But 13 percent of the boys also reported working in clothing factories or other parts of the textile industry. The legal age of employment in Bangladesh is 14, although 12 and 13 year olds are permitted to do what's deemed "light work" for up to 42 hours per week. Light work is not strictly defined but explicitly prohibits children from working all-night shifts or in railways, ports or factories. Quattri says this survey found that the labor laws are widely ignored. The government doesn't have the labor inspectors or other officials necessary to enforce them. She also says much of the work done by children is off the books in the informal sector, making it harder to regulate. "So they're mainly working for subcontractors in informal garment factories that produce a part of the product that is then sold to formal businesses. And the formal businesses export the product," she says. Bangladesh is a densely populated nation of 150 million people at the mouth of the Ganges River. It's made significant progress over the last two decades in cutting its poverty rate from 50 percent of the population down to about a third. But millions of Bangladeshis still live in sprawling slums. This new report from the Overseas Development Institute shows that child labor remains a significant problem in the South Asian country. Public education is free and compulsory only for elementary school. Quattri says the cost of tuition is one of the main reasons poor families said they sent their 11, 12 and 13 year olds into the workforce instead of school. This report and others suggest that millions of kids under the age of 14 are working in Bangladesh. The researchers found that the majority of working kids struggled to read the simple sentence "the girl is playing" in Bengali. Many of them couldn't read it at all. Once they start working 60, 80 or a hundred hours a week, Quattri says, it's very hard for them to ever escape these low-wage jobs.